Yippee! I'm very pleased with how quickly it is coming together! I never thought about it when I picked out the pattern, but knitting a sweater in the round rocks! No seaming to be done at the end! I'm almost to the end of the body length, then I do a small pattern for the bottom. It will be exciting to start knitting the sleeves! 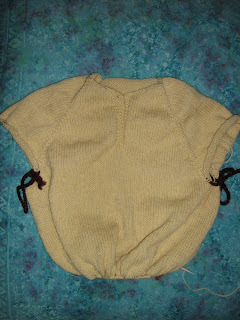 I can't help but think of it as a vest right now, but once I start the sleeves, it will really start to look like a sweater. I have been diligently knitting, even though my sewing machine is calling to me. I know myself too well. Once I start sewing, this sweater will get left behind and wont be done by the end of January. I am so close to finishing - I just can't let that happen! That is coming along so fast. You'll be wearing it in no time! Awesome, Samantha! You must be getting excited as you are so close to finishing your sweater. Yay! Resist the temptation of your sewing machine (can you believe I actually said that?) and keep going with those needles. I can't wait to see your finished sweater!